A great amount of digital ink has been spilled debating whether or not image stabilization mechanisms should be turned off while the camera is on a tripod. There is good reason for skepticism of stabilization while the camera is stationary. The sensors used to detect camera motion are not perfect; they contain some level of noise. In theory, this noise could be interpreted by the camera as movement, and it would try to compensate for motion that isn’t actually there, thus blurring an image. The logic therefore is that its better to be safe than sorry, and just turn stabilization off. On the other hand, the camera is still susceptible to movement while on a tripod, as no camera support is infinitely stiff. In theory, stabilization can help compensate for any movement that arises. The logic is then that its better to be safe than sorry, and leave stabilization on. In this post, I want to address just one piece of this conundrum. When using a camera on a tripod under absolutely ideal conditions, is it possible to see any reduction in sharpness when having stabilization on. If there is a downside to leaving stabilization on when using a tripod, we should find it here. I am going to use the most stable support in my arsenal, the Gitzo GT5533LS and Feisol CB-70D. This is way overkill for the Fuji X series cameras I will be using for the test. This leads us to a caveat. Each camera manufacturer implements stabilization differently in terms of both hardware and algorithms. 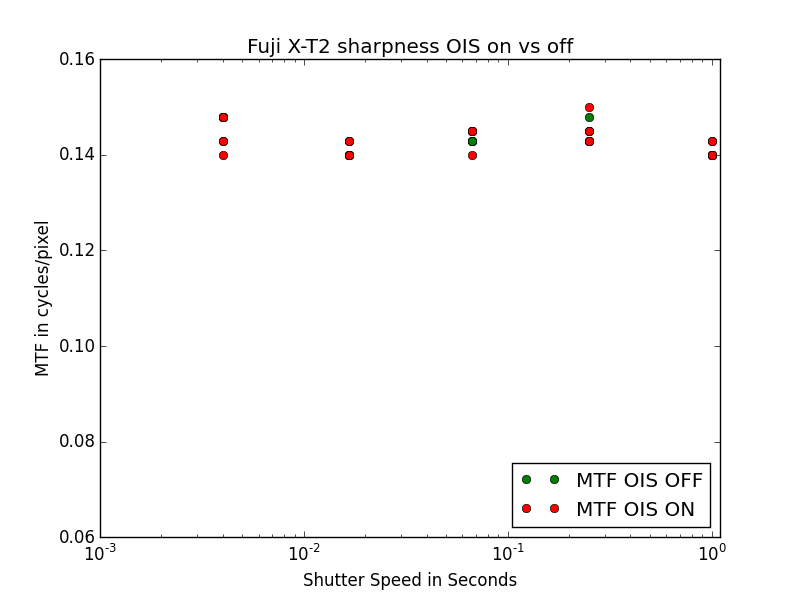 The results here only truly apply to Fuji X cameras. I am using the following procedure: Manual focus, then stop down to f/4. Take five raw images at each shutter speed of the MTFmapper test chart. Use five different shutter speeds with two stops between each. Load raw images directly into MTFmapper. Average the edge resolution from each image, and report it. Note that previously I ported the images through lightroom first, which applies default sharpening. The raw file has no such sharpening, so cycles/pixel will appear lower here compared to previous posts. There appear to be fewer green dots only because they have mostly been covered up by the red ones. The MTF results are damn near identical with IBIS on/off. There is no detectable downside here to leaving IBIS on. Next up is the Fuji X-T2 (which lacks IBIS) with the 50-140mm OIS lens. In this case I set the shutter to mechanical. This is because the X-T2 does not have EFCS, only ES. This might tell us if OIS helps with mechanical shutter shock as well. Again, the results with OIS on/off are identical. I don’t see any effects of shutter shock in this case, nor any degradation due to having OIS on. This test shows no downside to keeping stabilization on while the camera is on a tripod. It doesn’t show any upside either, though that isn’t surprising due to the tripod in question. 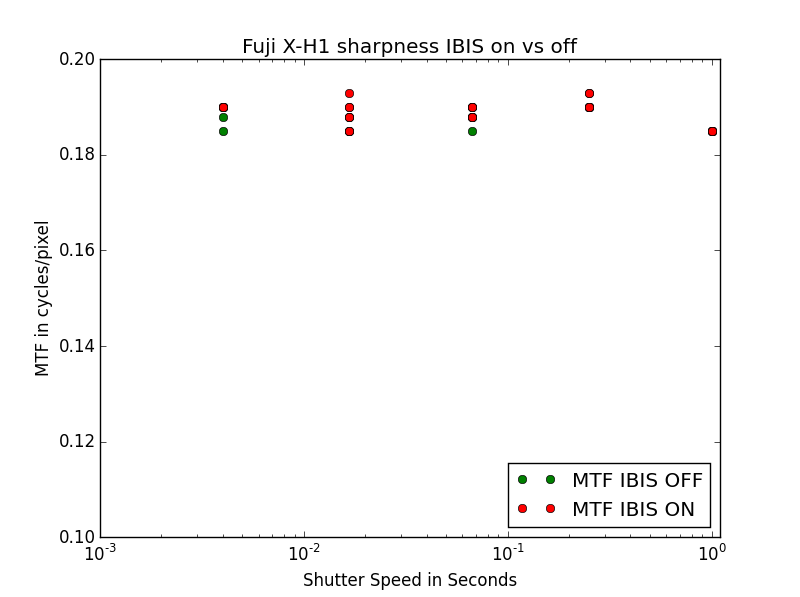 It is possible that Fuji is using a tripod detection algorithm and changing the stabilization behavior accordingly. Either way though, leaving the stabilization setting ‘on’ appears to have no effect on the on tripod image sharpness. I am. I’ve been experimenting around with this a little bit and should hopefully take some data soon. I currently have it set up to oscillate at 10hz, and the IBIS appears to be cancelling the vibration perfectly at that frequency.